This is our 2018 end-of-year review article. 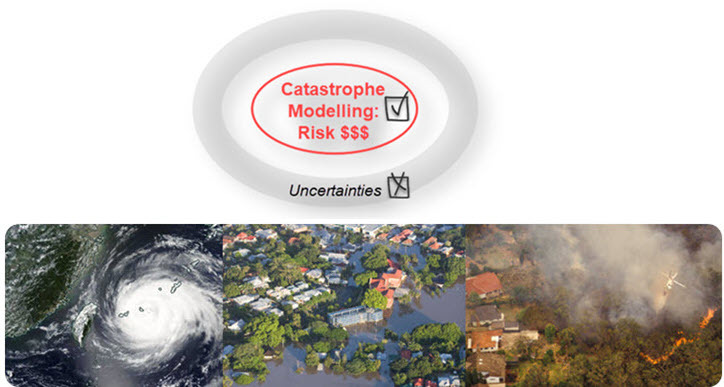 Catastrophe loss modelling, as a special type of environmental modelling, has been around for three decades. It captures all essential components of the classic risk equation, i.e. Risk = f (Hazard, Exposure, Vulnerability), and quantifies the likely economic or insured losses arising from natural perils (e.g. tropical cyclones, floods and earthquakes) and other forms of hazards (e.g. diseases and cyberattacks). Catastrophe loss models can be probabilistic or deterministic and have been primarily used by the (re)insurance industry to price potential risk and manage capital. The good, the bad and the ugly of the catastrophe loss models have been widely discussed across the modelling and user community. An overwhelming concern is the large uncertainties associated with the models, and scepticism follows. While two types of uncertainties (statistical or systematic) are often acknowledged at the conceptual level, we argue the largest uncertainty with the current modelling practice lies in implementation in relation to the data and analyses being used. This blog briefly reviews some of the new developments in this critical aspect of reducing uncertainties, and five perspectives are summarised (Figure 1). Web links to individual projects are shown, and a separate PowerPoint presentation file is also available (PDF, 5.5MB). It is insightful to see the performance of an individual model in comparison with the same type of models from different vendors. There are increasing interests and activities across the industry about model comparisons, e.g. The comparison provides a realistic assessment about the current applications of catastrophe loss models and exposes potential uncertainties. To have divergent results across models and lack of model predictability compromise the confidence of model uses. Also, they have serious implications for practices such as model blending or fusion. 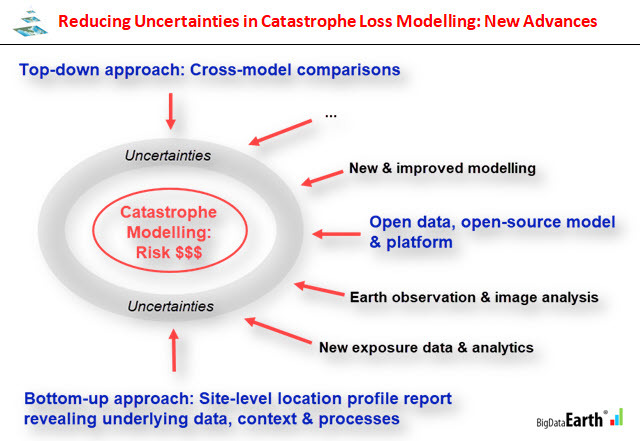 Catastrophe models are sometime regarded as the “black box”, and one may ponder this is largely man-made! There have been some new initiatives and great progress in achieving model openness and transparency, e.g. Significant progress has been made in relation to Earth observation data capture, data sharing, processing and applications over the past few years. More and more Earth observation systems provide high-resolution data (e.g. imagery, elevation and LiDAR cloud points), and government agencies (e.g. NASA, ESA and JAXA) release more data openly. Leading cloud services providers take advantage of this and make a vast amount of open data very accessible via cloud, e.g. Besides, cloud-based geospatial processing engines (e.g. GEE), with unprecedented capacity and capability, provide new analytical data that many catastrophe models require. Catastrophe loss models that use exposure data based on coarse and artificial areal boundaries (e.g. CRESTA Zones and postcodes) are increasingly scrutinised. This has been one of the largest implementation uncertainties in catastrophe loss modelling as exposure location often does not match with underlying hazard and other data in a spatially explicit manner. A common top-down observation has been that even for the same area, same input data source and same type of catastrophe loss models, divergent results are often produced by different vendor models. This demands a deep dive into the input and analysis used in models. A new type of information products with a bottom-up approach is needed to readily examine potential implementation uncertainties. We have been developing unique hazard and exposure investigation tools (e.g. location profile reports specific to cyclones, floods and forest fires), where a comprehensive set of location-specific metrics on the environment, hazard context and processes are created. Cloud-based, geospatial big data analytics platforms have been developed to enable and automate the delivery of such reports via web APIs. Coverage includes Australia, the contiguous US and other regions. Accessible location profile reports, purposefully containing many visuals such as imagery, maps, charts and animations, can be used to greatly help investigate some key aspects of the catastrophe models and associated implementation uncertainties (e.g. to compare or validate the common input used in models). We see site-level location profile reports should be an essential part of the modelling practice; to have many high-level models alone would not help. They are complementary to each other. Catastrophe loss modelling is evolving. New data and information about post-event claims and from multiple scientific disciplines, as well as fresh investigative perspectives, are always needed. It is important to keep an open and critical view in order to reduce model uncertainties and advance the modelling practice. If you are interested in more presentations and demos on this topic, please stay in touch.